The glasses-free 3D technology contained within the 3DS was arguably ahead of its time. Eventually though, Nintendo decided to focus on the more accessible and affordable 2DS line. Since then, it has shifted its attention to the Switch. So, will 3D gaming ever make a return? If a recent eye-tracking patent is anything to go by, perhaps it will. 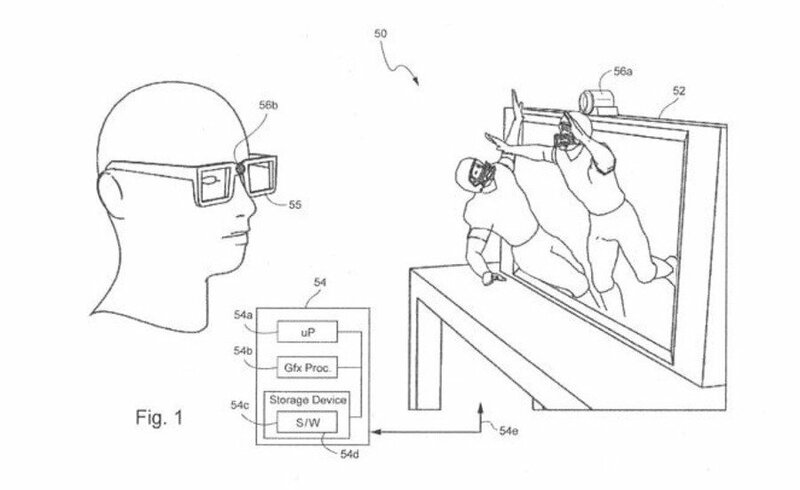 It’s been discovered Nintendo filed a patent application for “Eye Tracking Enabled 3D Viewing” last year in September, which was today published by the United States Patent and Trademark Office. The idea behind it is to provide an optimal 3D viewing angle for television users. The application mentions how this patent stems from previous ones dating back to 2010. It then goes on to address the common issues when viewing 3D on television sets. To solve existing problems, the plan is to place an eye-tracking device on the top of a display unit and allow it to track users with the help of a marker. This will allow for the best 3D image possible - with no special glasses or 3D displays required. In the above illustration, the user wears a marker on their glasses. Noticeably, it does not impede vision, like existing technology. As explained by Digital Trends, the mention of “viewpoint movement detection” to provide “collision-related game logic benefits” in the application, could provide many advantages within certain games. The application itself goes onto mention additional benefits, such as how the technology would allow “a player to dodge projectiles” and give “a game character an ability to ‘see’ the player when not behind line-of-sight obstacles”. It’s worth pointing out the image shown in the application is not new and actually dates back to 2014. Once again, the news here is the filing and publishing of the patent. There’s no guarantee anything will actually come of this application, either. Would you like to see the return of 3D on a newer Nintendo system? Tell us below. I know a good number of people quite liked the 3D. It could be because I already wear glasses to deal very bad near-sighted issue, but I have never been able to enjoy 3D. Though I loved the 3DS, I don't think I spent more than an hour or 2 total actually using the 3D. Pleeeaaase be VR for Metroid Prime 4. Basically the concept is very similar to Johnny Lee's Wii remote head tracking hack experiment. Look him up. Not interested in 3D, to be honest. Never used the feature on 3DS and I’ve always find that 3D video on TV and theaters only makes the experience worst. Just my opinion, of course, but I’m better without any 3D gimmicks. Do we really need this. If this turns out to be true, will a bunch of football players really invade my home? I only enjoyed dark moon in 3D. Probably because it is a slower game. I thought they used some form of this in the New 3DS line? Isn't that what Nintendo used to make the New 3DS screens basically what they should have had the first time? Nintendo is planning to sell 3DS games on Switch. All they need is a 3D glasses and a tracking camera to make it work with any TV. Maybe Switch Pro will come will a 3D screen. is 3DS Virtual Console coming to Switch? Stereoscopic 3D Switch, and they’ll get my money again. Virtual Boy 2: VR Boy. I'm intrigued to know how they intend to get a 3D effect without glasses or a special display. 3D will always be a gimmick until it can be done in high quality without glasses. It's certain not an essential feature, but I for one would be all for it if it's done well. I've used and enjoyed the 3D on my 3DS and New 3DS systems extensively over the years - and I do wear glasses all the time, including while playing, BTW. It has still worked well for me. (Especially having anti-reflective coating on my lenses - that makes it work even more consistently.) So I wouldn't be against seeing some form of 3D on the Switch. But again, it's nothing necessary either, so I'm also fine if they don't go for it. Problem with 3d is only one object is in focus at a time, like real life, but very annoying on a screen. I would love a return of 3D. On my 3DS, I had the 3D slider on max at all times and I am not talking about the new 3DS. Kidding! Kidding! This is more likely them poking at VR until the right opportunity comes along. "But VR has already been done!" Yeah, but Nintendo has an excellent track record of taking prior tech and perfectly integrating it into games for at least one gen (or game). @maruse you know 3d is how you see the world, yeah? The real problem with the all current 3d systems is they don't make you change focal distance so you can't judge how far away things are, just what's in front of what. Anyway, all that "3D" systems are not real 3D. It is just 2D that tries to give the illusion of 3D and fails miserably at it. All those 3D effects only make me motion sick so, no thank you. But if you enjoy it, by all means keep doing it. I don't have a problem with that. I love the 3D effect on my new 3DS XL., I leave it turned to the max I wear glasses and I have never had any problems with the 3D effect but I thought it was a face tracker on the new 3DS model not an eye tracker anyway I would more than be interested in a 3D Switch I would pick one up day one. Not a bad idea. I occasionally enjoy playing in 3D on the New 3DS. Just hope that if it comes to the Switch, they have a 3D level adjuster like the 3DS and New 3DS. This is clearly 3ds on big screen or 3DHDS. What I would like the most with the 3D feature is Dual Play or Simul View making its return. I liked the feature and local multiplayer with one TV and every player having one single screen would be awesome. I personally believe it to be a gimmick that's unfortunately had it's day. Please no. Done with the 3D thing altogether! As soon as I saw the headline I thought the same thing. Microsoft ended up hiring him. I play with 3D up to the max on original 3DS!! SM3DL, LM2 dark moon and MK7 look unreal. Love them and very disappointed Ninty have seemingly dropped 3D. I’d love a switch with eye-tracking steroscopic 3D and upres 3DS game capability. If Nintendo drops the 3ds or a 3ds by any other name, then it can be labelled just another Nintendo gimmick. As a market leader in 3d gaming we should already have a new 3d console. If Nintendo drop handheld 3d gaming then it's just as likely to drop the Switch when the next home console arrives. The Switch is good, much like a nice smartphone that is not a top of the range one. I would vote for a Nintendo home console with top end graphics and spec that displays games in 3d, over the Switch we have now. So if that happens, will we look at the Switch as a gimmick or a console that was good while it lasted. Keeping options open. End of story. Having PSVR i would love to see Nintendo bring VR in some shape or form. Imagine Metroid, Mario, Mario Kart in VR:) in the home. A surprising lot of people didn't like the 3D on 3DS. Personally, I loved it. I don't think I ever turned the slider down from max. I might be a good idea to have a 3d-add-on thing for the switch. I honestly thought Nintendo would move away from 3D and start to dip their toes into VR. If for no other reason than the Switch + Joycons being almost TOO perfect for a VR set up, even if the frame rate is too low to pull it off. The glasses-free 3D technology contained within the 3DS was arguably also a forty year old technique from greetings cards. The real benefit of proper eye tracking will be the ability to adjust the focus of a virtual environment to where the player is looking. This absence of this feature has been a main cause of disorientation and/or motion sickness for inexperience players of 3D games for over 20 years. And it's a huge issue in VR, most would agree. Even for the skilled player, such functionality would add considerable comfort. The thing I feel a lot of commenters are missing here is that you do not need a new fancy 3d TV for this system to work. As long as your display has a fast enough refresh rate, that's all that matters. The screen stays 2D. Your brain THINKS you're seeing a 3D image, but the head tracking device (the simple, cheap one from a Wii-mote, plus a head tracking infrared "marker") is what allows for the illusion by tricking your brain into never losing sight of your perspective. This means your eyes don't wander, thus breaking that illusion. It could work for any existing game that had a small patch added for head tracking support. SUPER CHEAP solution to immersive, 3D/VR gaming, and it's quite astonishing no one has taken advantage of Johnny Lee's discoveries sooner. Yes! People, you don't realize how exciting this is! Check out this video for a basic demonstration of the potential this has. This is 3D on an incredible level. @Scottwood101 i can't even imagine what 3d land looks like on a 2DS it must be unplayable. Its a cool technology that Nintendo could market beyond video games. The idea that any TV can become a 3D one that doesn't make you to wear glasses and hist a marker you could pout on a hat, your actual glasses, etc, is definitely appealing. In the next Zelda to aim the bow you have wear the joycons on your head like a hat. Probably just a re-up of the 3DS' stereoscopic 3D. (Or the Nintendo denied "Switch Pro" that could feature stereo cameras and a 3D screen hehe...). Won't get too worked up about it unless I heard more. I adore the 3D effect of the 3DS, i find it adds to the immersion of games greatlyi have it set to maximum and don't think i've ever turned it off, so i would love it to continue in some way, VR being the most obvious way, PS VR is the natural continuation of the 3DS in some ways, would love Nintendo to also keep the feature going. @MeloMan None of that is needed with this. Your current TV and Switch would work just fine. All you'd need is the IR camera set up near the TV, an IR "marker" near your head, and compatible software. This could literally make any existing game 3D (yes, even 2D games with parallax scrolling) with a simple patch of code to support head tracking. Ugh, I hated the 3D effect on the 3DS. And 3D TVs failed fantastically. Hopefully, playing 2D games after being so accustomed to stereoscopic 3D on the 3DS felt bizzar, flat, less exciting and less realistic. Realistic depth perception is FAR more exciting than 4k and HDR. It's a crucial component that's missing in today's entrainment solely because it's all over the map in terms of quality and has too many draw backs at this point in the game to make it convenient and less of a fuss. 3D , 4k, HDR and VR...I want it all! I'm a huge fan of stereoscopic 3D. It breaths new life into video games, 10 folds the immersion factor and makes the games come alive. Why wouldn't realistic depth perception be conceived as being just as important as HD or HDR? Heck. Urban champion 3D wad pure gold...I could imagine how amazing it all would of been in 1080p on a big screen TV the way nintendo did it.